Display ads could soon be served against Google image results. This would result in a significant increase in Google's display inventory and “represents a large opportunity" according to Marissa Mayer, Google VP of Search Product and User Experience. I was recently sent a link to Google Image Labeler (http://images.google.com/imagelabeler/). This program is positioned as a sort of image recognition game, enabling users to help label Google's images and help improve the quality of Google's image search results. 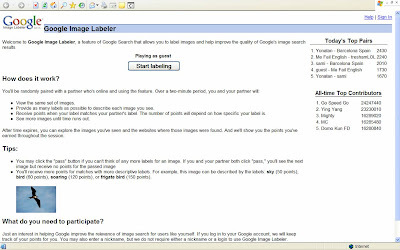 Google Image Labeler users are randomly paired with a partner, served a set of images over a 2 minute period and enter labels for the images shown. Labels that match the other participant gain points with a hall of fame table published on the Google Image Labeler home page. When the 2 minutes is up, users are shown all the images that they viewed and given the web addresses so that they can further explore the websites holding these pictures. 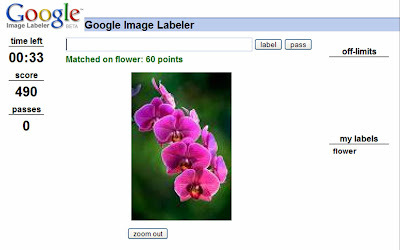 Google Image Labeler is strangely addictive and the more people that use it, the more Google's systems will develop in terms of image interpretation. A clever way of crowdsourcing and getting Google Images users to do the donkey work! VisualRank has been designed to ensure that the most relevant images or video are returned against enquiries. Not yet live, it is research in progress, but expect this to become as important as PageRank - if nothing else it could kickstart a whole new branch of SEO based around image / video optimisation. Google are therefore not sitting back and waiting for display money to roll in. The purchase of Doubleclick, the recent introduction of third party ad serving / tracking on the Google Content Network (http://googleblog.blogspot.com) and the projects outlined above all seek to expand Google's display offering. These moves are designed to prevent Google from becoming commoditised (by being seen solely as a Search provider) and seek to enhance the Google brand for both users and advertisers. Interesting to see how Google's display capability will develop - will Google ever challenge Yahoo! in display?